There are times when Jessica Paradis really has to scrimp. “I feed the kids, and whatever’s left over on their plates, I’ll eat,” said Paradis, a mother of three who lives in Brewer. Paradis is taking online college courses in human services. A single mom, she’s raising her three young kids. 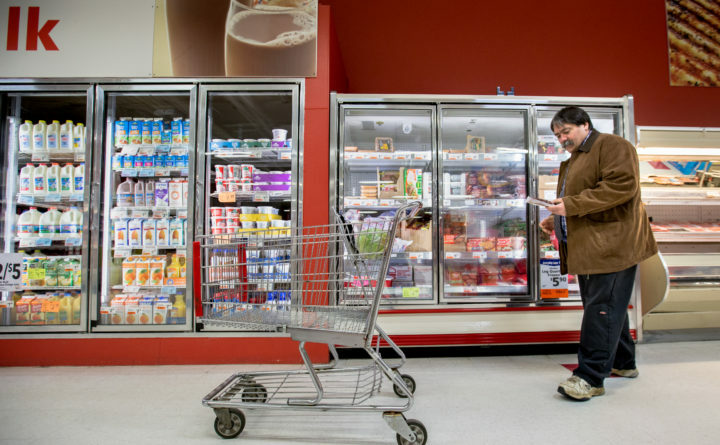 And since that makes it difficult for her to work sporadic hours at a part-time job, she patches together a monthly budget with the help of two benefit programs: Temporary Assistance for Needy Families and food stamps, known formally as the Supplemental Nutrition Assistance Program. She stretches her budget by visiting a local food pantry, by shopping at the dollar store and by making sure her kids eat before she does. Without food stamps, the math wouldn’t work. It still doesn’t some months. “I’m trying to get ahead, trying to work my way out of the hole, and a cut happens, and I get pushed back down,” she said. The next cut is under consideration in Washington, D.C., where Republicans in the U.S. House have proposed a budget that would cut more than 20 percent from SNAP. President Donald Trump’s proposed budget would make cuts of a similar magnitude. Already, SNAP doesn’t offer families much. The average Maine resident who benefits from it receives about $109 per month, which works out to $1.20 per person per meal. It’s far from a family’s entire food budget (an average American family spends $150 per week on groceries), but the little help the program offers goes a long way. New research from a statewide survey of SNAP recipients, published in a report by University of Maine social work professor Sandy Butler, paints a picture of the 178,000 Maine residents who receive the help, and what the food benefits mean to them. Almost 63 percent of Maine residents enrolled in SNAP come from households with children, and more than 43 percent come from households with members who are elderly or have a disability, according to the results from the survey of more than 430 current or recent Maine SNAP recipients. With SNAP’s help, 63 percent of those surveyed said they have enough to eat each month. Sixty-five percent said receiving SNAP enables them to eat and also pay their other bills. Carolyn Silvius, who spoke at an event in Bangor on Wednesday introducing Butler’s research, is thankful for the help she receives, but the small amount still forces her to make choices she’d prefer not to have to make, such as buying canned goods instead of fresh foods. Without SNAP, most of those surveyed said they wouldn’t have anywhere to turn to get the food they need. Sixty-two percent said they thought they would get little to no help — far from all the food they would need — if they lost their benefits. Not from local food pantries, and not from family members. Maine already has one of the highest rates of food insecurity in the nation: It ranked seventh in 2016, according to the U.S. Department of Agriculture. It ranked third in the nation for the percentage of households with very low food security, when households had to cut back on their food intake because of a lack of money. As food insecurity has dropped nationwide in recent years, it’s risen in Maine. Republicans in Washington, D.C., are proposing tax breaks that would disproportionately benefit the nation’s wealthiest. Meanwhile, families that depend on SNAP are already struggling to find enough food and balance their household budgets. Now, they have to worry about seeing the lifeline that helps them with both of those basic priorities disappear.